As the popularity of Korean foods is growing, I noticed that one of the most popular Korean dishes among non-Koreans is bibimbap, along with bulgogi, tteokbbokki, soft tofu soup. I can see why people love bibimbap. It's not only colorful to look at, but there are so many different flavors tossed into a single bowl of rice. Each ingredient is tasty enough on its own. When they are all mixed together, the harmony of different flavors is enhanced with its spicy dressing. 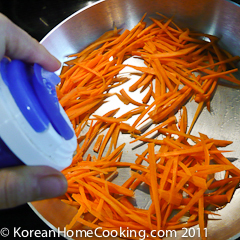 Bibimbap is not a simple dish to make because you are really making several different dishes and each takes time. Once you have them ready, it's easy since all you need to do is to mix them together. 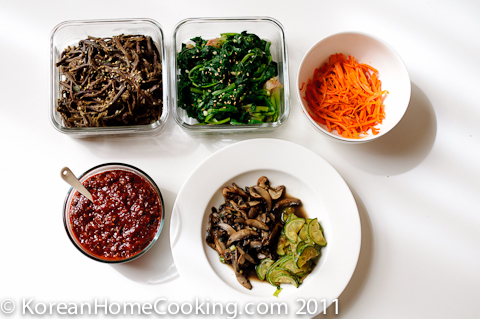 Note that the ingredients that go into bibimbap may vary depending on the availability of ingredients or your preference for specific ingredients. 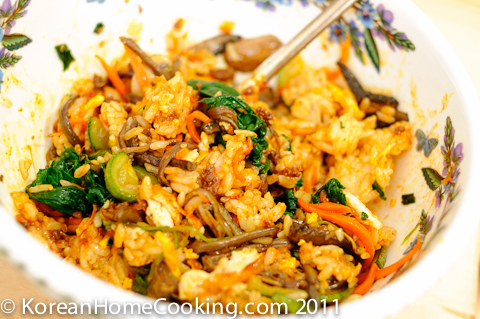 After all, bibimbap literally means "mixed rice" so it doesn't really matter what you mix with. 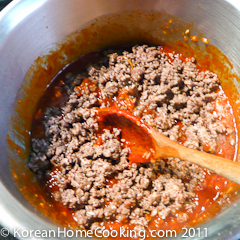 See Beef Chili Sauce fore detailed recipe. 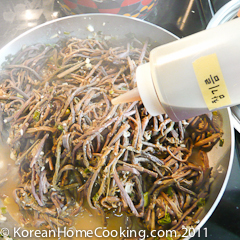 If you have bulgogi as topping, you can use regular chili paste instead. 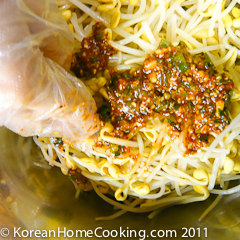 See Bean Sprout Salad for detailed recipe. See Spinach Salad for detailed recipe. See Gosari Salad for detailed recipe. 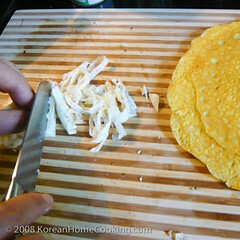 Separate egg yolk and white, spread them thin on a skillet, pan fry and then cut thin. See the recipe for Party Noodle Soup for pictures. 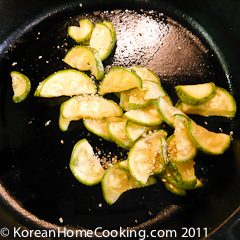 Salt thoroughly sliced zuchini and wait 20 minutes. 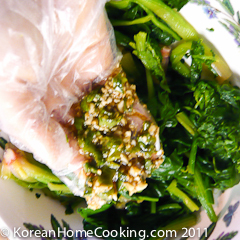 Squeeze out water, pan fry with a pinch of ground sesame seeds. See the recipe for Party Noodle Soup for pictures. Mmmm, this is making me so hungry! 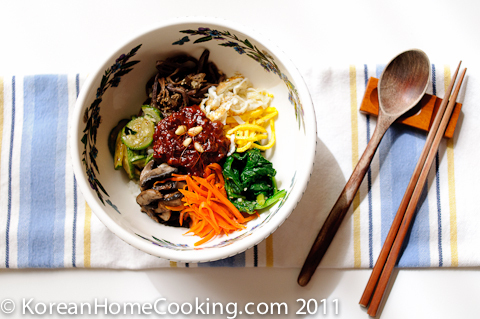 Bibimbap is my very American husbands' favorite food. He will be so grateful to you!!! Thanks for this great recipe, Migi. 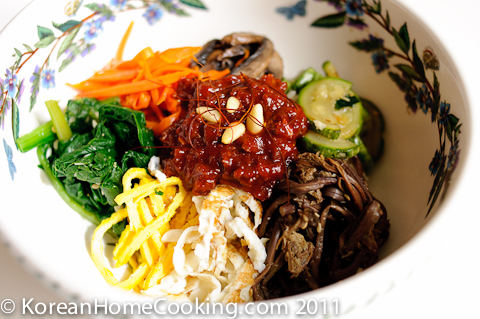 Bibimbap is one of my fav Korean foods. I have never attempted making at home though. Now I shall give it a try. @Juhee, Renee, S&C - Gracias! The gigantic-sized Optimus Vu can be called a Phablet replica wathces due to its smartphone capabilities and tablet size. Being, the second Phablet in the market, Optimus rolex replica Vu carries a 5.0 inch display with 1024 x 768 of gucci replica screen resolution, an 8MP primary camera, dual-core 1.5GHz processor in the hood chanel replica with 1GB of RAM and 32Gigs of internal memory. It still carries a stylus for more productivity replica handbags.